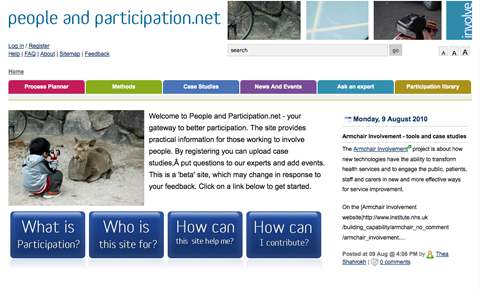 This site, www.peopleandparticipation.net outlines ways to plan for and evaluate participatory practice for people who work in the public, private and not-for-profit sectors and who need to involve a wider group of people in their work. It includes a ‘process planner’ which helps to choose participatory methods that are suitable to your situation. They’ve got an excellent library of resources here.